As I was driving home from what ended up being a three and a half hour dinner/chat with Donalyn Miller (it's hard to stop talking when you see each other so rarely and are having so much fun), I was thinking back on what Chris Lehman said each time I've seen him speak recently, whether in reference to reading or writing, about making time for what's important. We make time for what's important in the classroom for the reading and writing and the talk and the community building and relationship building because we make time for what's important to us, and those are the things that are important in helping students develop. And as I was driving home, I was thinking about this and realized that it was important for me to make that time last night. No matter how busy or tired or overwhelmed by to-do lists or thinking about teaching the next day I am, it's important to make the time for evenings like that with friends who understand and can relate to what I do everyday. Talk is important...it's a way to work thorough things I've been thinking about, confused by, wondering about...it's a way to process my ideas...it's a way to feel better about where my head is at. It's important. I need to make time for it. To make that time to discuss and just have a really enjoyable evening was important. Because I need to make time for what's important to me. 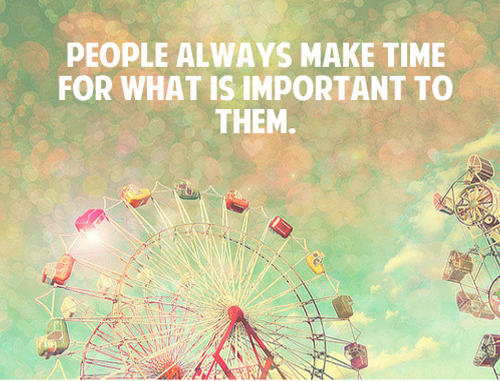 You make time for those things that matter and I'm glad for the people who make time for me. Friends who help me to be a better person. People who make time for what's important-that connection and community. I make time in my classroom for reading and writing. It's important for my students to believe they're readers and writers. I need to make that dedicated time for them to experience and delve into their reading and writing because that's what is important. It's important for them to find the joy and interest and motivation and engagement in reading and writing. I need to make time for that because it's important. The kids who enter my classroom need to discover themselves as readers and writers and believe that they can do it. I know that's important...and everybody should make time for that. Lots of good points - saying "I don't have time" really means "I'm not going to make that a priority." Reading and writing HAVE to be priorities in our classrooms. A 3 1/2 hr. dinner/chat with Donalyn Miller?? How fun! Yes, many great points. Whether it is conversation, commenting, exercising or reading, we all need to squeeze out space and time for what truly matters. Great post.